These Honey Glazed Baby Back Ribs are easy and delicious are so DELICIOUS! One of the favorite food of Mr. Rasa Malaysia is baby back ribs. He loves all sorts of ribs, but especially partial to Chinese-style ribs and American BBQ ribs. He doesn’t have much of an opinion whenever we dine out as I am always the ones who decide where we eat at, but whenever he is in the mood to take charge, his answer is pretty predictable: ribs. He has taken me and his friends to unknown restaurants at obscure places, for some hole-in-the-wall ribs. If there is one thing he is obsessed with when it comes to food, I think that would be it, and very lucky for us, our good friend Slap Yo’ Daddy is one of the top BBQ pit masters in the US, and he would always bring us some of his award-winning and extremely delicious baby back ribs. These honey-glazeed baby back ribs was prepared for him. I am not much a ribs person, other than using them to flavor my Chinese soups or stews, but I was pleasantly surprised with the sticky, gooey, and addictive great taste of this recipe. This honey-glazed baby back ribs recipe is adapted from the Food & Wine magazine. I love the addition of sambal oelek or chili-garlic sauce for a tint of spicy note. Either way, Mr. Rasa Malaysia happily devoured the dish which was specially cooked for him. 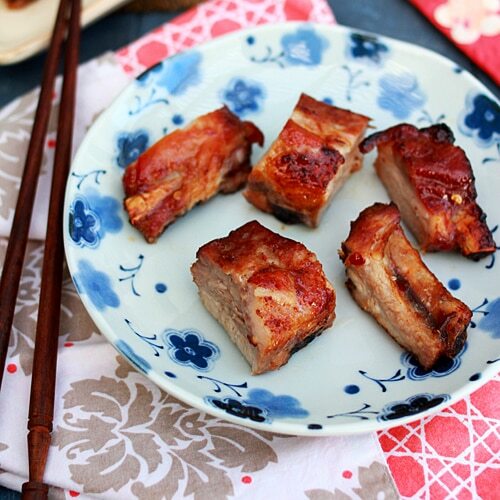 If you love yourself some Chinese/Asian-style good ribs, you can certainly try this recipe out! Honey-Glazed Baby Back Ribs Recipe | Easy Asian Recipes. Mix all the ingredients for the Marinade Sauce in a bowl. Stir well to combine. Lightly season the baby back rib with salt, to taste. Brush the ribs evenly with the Marinade Sauce on both sides and marinate for at least 8 hours or overnight in the refrigerator. Preheat the oven to 325°F (160°C). Line a large baking sheet with heavy aluminum foil, lay the ribs on top, and tightly cover with foil. Roast for 2 hours. Remove the ribs from the oven and uncover. Brush the ribs with the honey. Transfer the ribs to the broiler and broil at 500°F (260°C) for 5-6 minutes or until the ribs are glazed and browned to your liking. Slice them into individual ribs and serve hot. If you prefer, you can use pork spareribs instead of the baby back ribs. I made a recipe of honey glazed baby backs last week. I doubled the amount of honey. These are delicious. Thank you for your recipe. I’ll use it next time. I do baby backs a couple of times a month. If you peel off the membrane from the back of the ribs, the sauce gets to the meat better and just increases this lovely flavor. This sounds like a very sweet recipe. I have some BB ribs in my freezer, will give this a try. Love ribs! It’s amazing how flavourful ribs get after slow roasting. Wud luv to try the recipe, however, what is unsulfured molasses. Can I replace this ingredient with something else. Thank u. That combination sounds delicious. I’ll give this one a try too. Ribs must be one of the most manly things to prepare in the kitchen. Anything ribs with a touch asia goes down any day, if it’s good. Can I replace the honey with brown sugar?as I m allergy to honey….